I’ve gone to great lengths to make certain that my road bike is set up as close to perfect as possible, within my budget, with one exception. My bike shop pro, because of my age, newness to cycling and flexibility (or lack thereof), had my stem raised about an inch and three-quarters higher than where I’ve got it now. It was very comfortable but I struggled in situations that called for aerodynamics. Even down in the drops I’d still catch a good bit of wind. My bike came home after my fitting with about 2-1/2″ (6.35 cm) of drop from the saddle to the top of the handlebar. This is better than some I’ve seen, where the bar top is level with the saddle and the bars are turned up to raise the hoods, propping the rider upright to a point that the resulting riding posture is similar to a mountain bike, but I was riding with the advanced group… I was a noob, sure, but I didn’t want that fact to be too identifiable (in addition to my riding ability). My first thought was to simply slam the stem and learn to live with it, but doing that can lead to all types of physical problems. Back pain and hip pain from being hunched over too far, and shoulder, arm pain from putting too much weight on the arms and shoulders to keep the position right. Finally, this is also can lead to hand numbness for the same reasons. I went from 2-1/2″ (6.35 cm) to 4-1/4″ (10.85 cm) of drop without pain issues that would have likely occurred had I gone with the option of slamming the stem all at once. 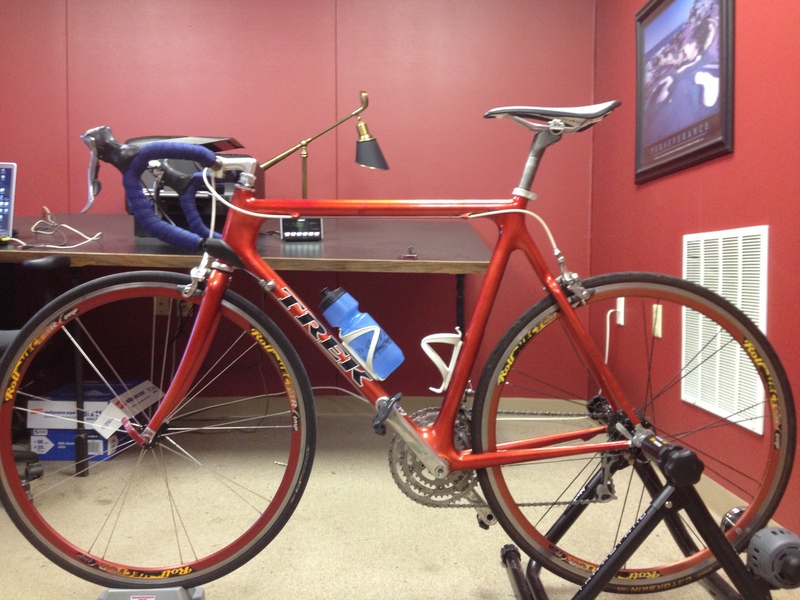 The image above, because it was taken from a position slightly lower than the top tube, gives the appearance that the bar is angled up slightly… This is an optical illusion, the bar and stem are in perfect alignment. At this point I am currently as aerodynamic as is possible on that bike, in its current configuration. There are things I could do to alter it, change the fork and stem to a threadless, or cut the current setup down a little, but in all honesty, if I were to bother going that route it would make more sense to just buy a new bike, and that is utterly unnecessary. Those who have been following my blog through the summer may note that I have written about shoulder pain and having to go to a back/neck cracker for relief… While some of the issue could be thought to be attributable to the lowering of my stem – I believe I even made mention that it could, it was not. The issue was more related to gripping the right hood tightly. After changing the way I grip the hoods the problems have subsided. You can see my reply below and if you’ve been here for very long, you know about how cozy I am with my feminine side… Now I’m not saying guys shouldn’t do yoga and chants and stuff (obviously in a manner other than the mocking oooowwwwuuuummmm…), I’m just saying I’m not that kind of guy (not that there’s anything wrong with that – I’d bet there’s yoga person out there who could tell us of a football player who does yoga!). UPDATE 11-15-2013: I bought a new bike, a Specialized Venge at the end of August. The new bike has a 4-3/4″ drop but it has shallow drops. This combination has proved to be spectacular. I’m able to get quite low on the hoods and I’m as close to flat as possible. It’s perfect, and with everything properly lined up, there is no pain. So it’s been a few days on the trainer now, with a ride or two thrown in there just for fun and it hasn’t been so bad – at least not as bad as I remembered from March, of course if you give me a few more months cooped up in my office I’ll be singing a different tune (of course that still beats the gym). The truth is though, I really hate riding in the crap more than I hate being cooped up so there’s that… But no traffic, no left turns, no stop lights or stop signs and no headwinds… And Fifty bucks says come February I’ll be praying for fresh air and a little wind. For now, it is what it is and while I’ll throw in outdoor rides where I can, I gotta tell you, I’m happy. For a half hour or 45 minutes it’s just a good movie and a spin at lunch. I’m really happy with the new trainer too, it’s a bit harder to pedal on than the one I used last year and that’s definitely a good thing. I could lie and say I’ve got some ornate training plan with special food, wildly intricate interval schedules and that I’ve got my on and off days scheduled out weeks in advance – but I don’t and I’m certainly not planning on putting too much time or effort into putting anything together. Next year, at least from where I’m sitting now will look a lot like this year because I’ve come a long way since last summer but I’ve changed a little bit too. Last January I was ready to race – triathlons, a couple of Olympic lengths and a Half Iron Man, maybe a few 5k’s and a 10 miler, but somewhere in there I found out that I don’t want to forsake the riding for the races and that’s when I changed… I really don’t care if I ever race (at least that’s where I am today) because to get good enough to do that will be work. I don’t want a 25 mile ride to be work with certain warm up times, followed by intervals, followed by cool downs… I just wanna ride, so that’s what I’m going to do, because for now, it’s all about the journey. How Do You Handle Sleep? October 30, 2012 7:01 am / 8 Comments on How Do You Handle Sleep? It’s 2:39 am. Coffee is made and I’m watching wall to wall coverage of Sandy that repeats (with different people) every 20 minutes or so. I’ll be in the shower by 3:30, out the door by 4 and in my office by 4:45… And look at this as a good thing. I’ll have at least two hours to get work done before the phones start ringing. I’ll take a power nap at noon, after lunch and before my daily office spin. Then I head off to a post bid, pre contract qualification meeting at three. Immediately following that meeting I’ll head home, 11-12 hour day in the bag. From there, God only knows when I’ll fall asleep. So the title of this post was a question, how do you handle sleep? Do you sleep when you’re ready, circumstances be damned? Are you more regimented? Is it about time or quality? UPDATE: It’s 5:03, the lights are on but I’m running a little behind… I left on time but had to deal with snow on the way in… SNOW! For the love of Mike, this is simply not right. In other news, I’m working on a bit of a blockbuster post – and I’ve got a ton of work to get through over the next few days, so posting will be sparce while I’m working through everything and doing my research. In the meantime, I’ll probably keep any new posts short and sweet. It didn’t make very much sense as cold as it was up here in Michigan yesterday morning, 38 balmy degrees – or 40 degrees colder than the day before, for a bike ride to be “fun”. It was so cold that I had to keep my head down to break the wind with my helmet rather than my face. I was prepared for the blast of cold, but I sure wasn’t ready for it. I was prepared, I had a light running shirt on, my cycling jacket, gloves, bandana to keep my ears warm, tights and even my slip on foot covers… But once I hit 20 mph I was intensely reminded how much colder it is at 20 than standing still…and how much more difficult it is to make the muscles work when they’re cold. They came out first with a salad that my wife ordered… Just a simple lettuce, cucumber, carrot and radish salad, with the most amazing vinaigrette dressing I’ve ever tasted… Ok, the sharing thing wasn’t so bad. Then came the salt and pepper fries with homemade ketchup. Oh, my. Then came the cheese and bacon infused burger… Yes, I used bacon and infused in the same sentence to describe a delectable, juicy, wonderful burger. Yeah, that’s pretty much where the sharing ended. So here’s the deal with the “small plate” thing: the plate was small – the food, on the other hand was most decidedly not. Call me a simpleton. Now here’s where it gets fun… I cut back too much in the caloric intake and wound up loosing three pounds that I could ill-afford to loose (cue faint violin music: “My Heart Bleeds For You”). Well, it should be quite obvious that the best way to replace those three pounds is to consume calories – and sadly, lettuce, spinach and veggies are a little light on the calories – I’d have to eat, what, four pounds of salad to gain three pounds back? Well, I’ve never been an overeater so the Chocolate Pudding, baked over chocolate cake with vanilla ice cream made much more sense. I know, I know, don’t cry for me – life is full of sacrifices. Folks, I’m here to tell you, Raymo’s was the most satisfying dining experience I’ve had in years. Dinner was followed by lots of coffee and a fantastic local Blues band. We arrived for dinner at 6:45 and didn’t leave until 10:30. We laughed and ate and drank (coffee) to our heart’s content… And on top of that, I got the back yard’s leaves cleaned up. What a perfect Saturday… 18.5 average on the way down 3-5 mph tailwind. 17.5 average on the way back, into a 15 mph headwind – and i enjoyed every minute of it. Perplexity or uncertainty over what to do in a difficult situation: “Jim is in a quandary“. A difficult situation; a practical dilemma. Yes, he most certainly is in a quandary. The situation is not difficult, per se, but I am stuck as to what I should do this morning. Today will be our last decent riding day for at least a week. We’ve got partly cloudy skies and a medium heavy wind out of the north at 9-15 mph and a high of 53 on tap for the day. On top of that, it’s date night and my wife and I are going out with English Pete and his wife to celebrate their anniversary tonight (I know, the Tigers are playing, but he’s one of my best friends on the planet – sometimes you’ve just gotta take one for the team, eh? )… So the question is, do I go out for a 25-30 mile bike ride, stopping in at the running club for a bit – for the last time in at least a week, or do I drive down and go for a run? If I run, I’ll most certainly be sore tonight when we go out to dinner. If I ride, I won’t. If I run, I’ll likely get home and take a nap. If I ride, I should have enough left in the tank to cut some grass when I get back. It is a pickle for sure, but here’s he deciding factor, I think: If I ride, I’ll have more fun, both during and after the workout. I think I’ll go for the ride.